Since I seem to be incapable of typing either accurately or fast using my iPad’s onscreen keyboard, I decided to try using my Apple Bluetooth Keyboard – the one I normally use with my MacBook Pro. One would think switching up devices would be easy. Just turn off Bluetooth on one device and turn on Bluetooth on the other device. So, I turned off Bluetooth on my MacBook and turned on Bluetooth on my iPad. No luck – the iPad didn’t see the keyboard. It turns out, that in order to use my keyboard on a different device, I need to actually “remove” it or “forget it” on the previous device. Once I do this, the keyboard will show up on the new device and allow me to pair it. 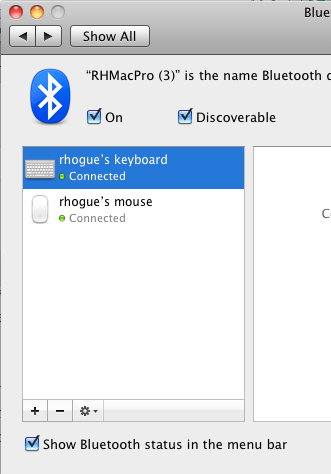 On the Mac, Open Bluetooth Preferences. Select the keyboard and click -. On the iPad, open Setting and select General > Bluetooth. Once your device has been found, enter the numeric sequence specified to pair to the iPad. 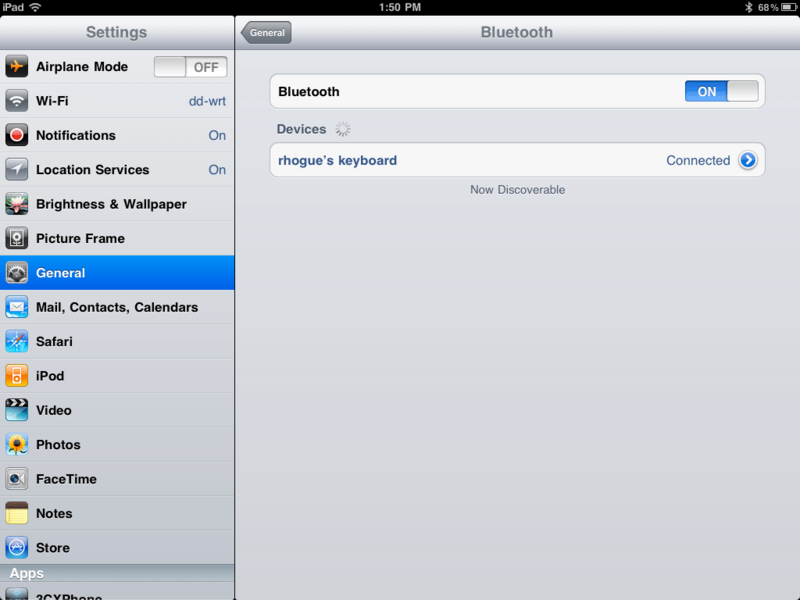 On the iPad, open Settings and select General > Bluetooth. Touch the open arrow button next to the keyboard listing. Enter the key sequence to pair the keyboard. I use the keyboard with my iPad to take notes while reading textbooks (using Evernote on the iPad). This seems to be the most efficient way for me to write on the iPad. I did order a Zagg keyboard case, which should be here in the next couple of days. I’m looking forward to having the dedicated keyboard for the iPad, so I don’t have to keep running the above procedure to switch between devices.